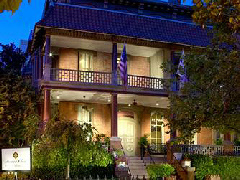 On the National Register of Historic Places, this boutique hotel began life as two houses both built in 1864. Today, though, it boasts 41 guest rooms, 13 suites, and an award-winning restaurant. The property was purchased by the Women’s Army and Navy League in 1923 and was subsequently used to accommodate enlisted men staying in Washington DC. The military club was traditionally headed by First Ladies with Grace Coolidge being the first to preside. Many of Washington’s landmarks are within walking distance of the hotel, including The White House itself.